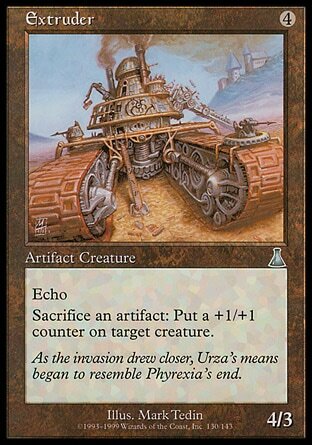 This card is either very good vs paradoxical outcome, or it is terrible depending on rules interactions. If a player announced paradoxical outcome, pays for the cost of it with 4 Mox mana, how many moxen can they target with Outcome before the triggered ability from this card resolves. I’d assume since the spell was announced, that all the triggered abilities would go on the stack simultaneously, and they could cast outcome targeting the 4 moxes before the triggered ability resolves. @gkraigher if you just announce outcome and tap your moxen to pay for it, the triggers resolve first, stealing the moxen, and they don't bounce and you don't draw. the proper way to do it, from the outcome side, is to activate the mana abilities(and anything else, like top, that must precede outcome) and then cast outcome in response to the Nabber triggers. all bounce, all draw, none borrowed. So this card does nothing against Outcome. Shame. @gkraigher Unless the P.O. is countered. Potentially high risk for the P.O. player if this found any purchase in a blue shell. @necrogeist doesn't need a blue shell since it's red and pyroblast hits outcome! @tittliewinks22 Very good point, I like that much better! It's only scary if your opponent has something to do with that extra mana, in which case a Mana Drain seems far more useful for them. Or if they have an Atog. Yummy moxen. It also grabs any moxen used to cast non-Paradoxical spells. Even if that's just the Pearl that cast a Sol Ring, that's pretty okay.